When last we left the piano keyboard we neglected to discuss the names of the black keys. In fact, we did not even give all of the possible names of the white keys. The distance between one A and the next A on the keyboard is one octave. And out of all of the seven white keys and five black keys within an octave, I assert that all but one of them have three different names. One unfortunate key only has two names, and we’ll find out which one that is and why. There are things in music called sharps and flats, and there are also double-sharps and double-flats. These act as “modifiers” for the standard letter names. 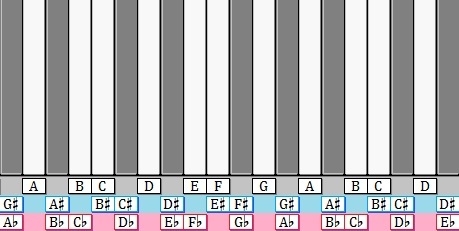 Based on what we’ve said so far, you could expect there to be a total of thirty-five different names for the notes in an octave. You know there are seven letter names, A through G, and there are five variations of each using the four modifiers. For example, in the “A family” there’s A, A-sharp, A-flat, A-double-sharp, and A-double-flat. Total names: 5 x 7 = 35. Also, the keyboard has seven white keys and five black keys in each octave, making twelve altogether. If each key had three names, there would be thirty-six names. But I asserted that one key has only two names, so we actually have only thirty-five names. Total names: 12 x 3 – 1 = 35. Here’s a wacky stretched-out keyboard where the twelve keys are equally spaced. We’ll use it to help visualize how sharps and flats work. We’ve used twenty-one names so far. One way to figure this out is that for each of the seven letters, we added a flatted version and a sharped version; total: 7 x 3 = 21. Another way: seven names were given to the white keys from the letters A through G directly. Each of the five black keys has two names, and four of the white keys have one extra name in addition to the single-letter name. Our total: 7 (A to G) + [5 x 2] (black keys) + 4 (additional white-key names) = 7 + 10 + 4 = 21. So far we’ve named all of the twelve keys at least once (and nine of them twice). So from here on in, we’ll be adding additional names to keys that we’ve named already. A double-sharp raises a note by two half steps (or, equivalently, one whole step), and a double-flat lowers a note by two half steps (or one whole step). 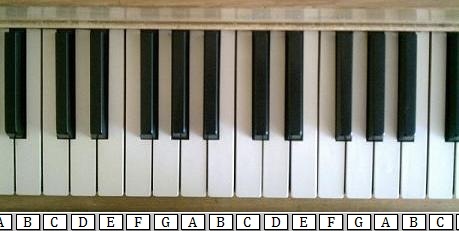 Some of the white keys now have three names from the list above. 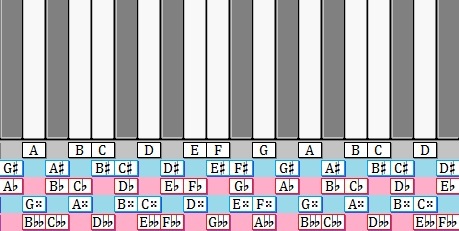 Some of them only have two names in the list above, but notice that they are C, E, F, and B, and these four have already been given an additional name (e.g., C is B-sharp and also D-double-flat). So now all of our white keys have three names. Whichever key gets gypped is going to be one of the black keys. After the sharps and flats we had accounted for twenty-one names. We added at least one additional name for each white key in the list above. Three of the white keys got two additional names. So we added seven (one for each white key) plus three more (for the white keys that got yet another name). Total: 21 + 7 + 3 = 31. Four to go! Let’s finish this off and consider the other four cases. If we start at E and move two keys to the right, we pass over F and end up on the black key to the right of F, which as we know is also called F-sharp. So E-double-sharp is the same key as F-sharp. Similarly, if we start at F and move two keys to the left we pass over E and end up on the black key to the left of E, so F-double-flat is the same key as E-flat. Similarly we can determine that B-double-sharp is the same key as C-sharp, and C-double-flat is the same key as B-flat. If you look carefully at the picture above, you’ll see that all the keys have three names except one: the key between G and A! This key only has two names: G-sharp and A-flat. 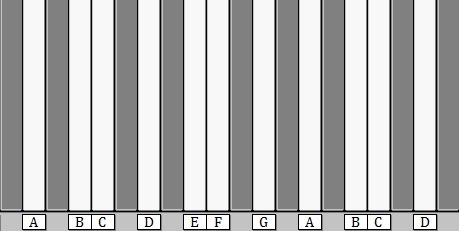 In a sense you could have predicted this by trying to guess which of the keys within an octave could possibly be unique. There are a bunch of white keys that are between two black keys, and there are two similar pairs of white keys without any black key between them. So none of the white keys appear to be unique. There are two groups of black keys, and both groups have a black key on the left and a black key on the right, but there’s only one black key that isn’t either the leftmost or rightmost in its group: the one in the middle of the group of three. So if you had an inkling that sharps and flats had something to do with keys that were next to one another, you might have guessed which key would be the odd man out.